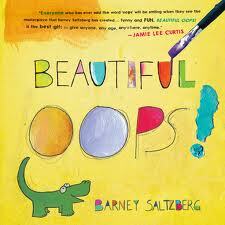 A while ago I shared one of my favorite books for supporting students in risk taking, Beautiful Oops. While the book focuses on the beauty that can follow artistic “oops” experiences, it also can spur discussions of successes that can follow all manner of not-so-successful efforts. We celebrate mistakes in this classroom. Every oops is an opportunity to make something beautiful. There is a blog for Oops art projects (and perhaps, in time, projects in other disciplines) and the opportunity to share your ideas, or follow #BeautifulOops on Twitter or other social media. You can also send an “old school” email to request free stickers and other classroom materials. I haven’t received mine yet so I don’t know what they include, but Free is always my favorite price. If you have students who view errors as disasters, or are just ready for some artistic creative fun, you might want to explore the world of “Oops.” When you find something wonderful, I’d love to hear about it. Thanks so much for this! I have been searching for a way to get my 2nd graders to be “fearless” in their work. They are so afraid of ‘getting it wrong’ that they somethings can even begin. This is a good way to start the school year and revisit it during the year.